Designed for small businesses and startups in Gibraltar. 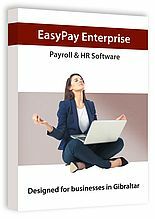 If you are looking for an easy, fast, accurate and cost effective way to run payroll for your Gibraltar business then check out EasyPay Standard. Suitable for companies with less than 10 employees. If you use an existing solution, you may be able to import your historical data and get running straight away. Then £70 for further years. For businesses, larger than 10 employees, we recommend EasyPay Professional. This version encompasses all of the features of EasyPay Standard plus a lot more time saving payroll and HR features. For example, more comprehensive employee records for HR, multi-currency, benefits in kind payments and leave record management. EasyPay Professional is priced by the number of employees in your organisation. For organisations with over 250 employees, we offer EasyPay Enterprise. Ideally suited for payroll bureaus and organisations with busy payroll & HR departments, this version of EasyPay supports additional high end features. Features such as unlimited number of employee records, audit logging, high end server support for improved stability, performance and recovery options. We also offer support agreements for additional protection and to offset operational risks.